A colorful and provocative survey of anarchism in America, the film attempts to dispel popular misconceptions. Nobody knows what caused the cut cables in the Mediterranean that interrupted Internet service to parts of the Middle East last week, but there are now conspiracy theories galore written by bloggers and pundits. Some say it will benefit terrorists and Iran somehow. In fact, the cut cables — originally blamed on ships dragging anchors — look more like a ploy by some intelligence agency to disrupt Iranian commerce, specifically an emerging oil bourse that the Iranians have been quietly establishing and hoped to roll out fully in the next 60 days. This concept seems a little farfetched until you look at the details which were provided to me by one of my readers, Martin Kuplens-Ewart who has been following the story from the outset. He notes: “there is a substantial event that has effectively been killed by the loss of connectivity: the launch of the Iranian Oil Bourse. Ralph Nader (born February 27, 1934) is an American attorney and political activist in the areas of consumer rights, humanitarianism, environmentalism and democratic government. He helped found many governmental and non-governmental organizations, including the Environmental Protection Agency (EPA), Occupational Safety and Health Administration (OSHA), Public Citizen, and several Public Interest Research Groups (PIRGs), including NYPIRG. Nader has been a staunch critic of corporations, which he believes wield too much power and are undermining the fundamental American values of democracy and human rights…. Keith talks about the David Shuster, and apologizes on behalf of MSNBC. Noam Chomsky explains why the existence of massive concentrations of private power preclude devolution and limitations on the power Federal Govt. from being viable strategies to creating a more free society. The illegality, immorality, and blunderings of the Bush Administration has, for the past seven years, angered a nation, shocked the world, and trumped the rules of law and justice like no other presidency in US history. Further violations of the constitution have come in the form of illegal wiretapping, the illegal monitoring of US citizen calls both within and out of the United States (all with no burden of proof for probable cause), and in the collection of personal data by private corporations, which is then used for domestic spying. Remarkable to this administration is its continued references to the ideals of democracy, freedom, and justice, when these ideals are hardly promoted in US foreign policies. For instance, the claims of stability, freedom, and democracy for the Iraqi people while systematically displacing millions and killing innocent civilians by the hundreds of thousands brings new depth to the meaning of the word hypocrisy. Even more alarming during the next few months the Bush administration will continue to thumb its nose at the rule of law, the balance of power, and the Constitution, while the world watches in an almost helpless stupor. Included in this power grab will likely be another preemptive attack on a nation accused of coveting WMD’s, Iran. Which, if carried out with the intent of destroying Iran’s nuclear facilities and any facility that may have nuclear knowledge (including universities), will lead to a “collateral damage” figure of 2.8 million deaths. This is of course, if the administration chooses the course of restrain, as these figures are for the bombing of only half of the suspected sites. If one were to examine the Bush Administration closely, one could easily make the connection that the fundamental problem lies with its continued abuse of The Constitution. In fact, every illegal, immoral, and thoughtless action this administration has perpetrated on its citizens and the world can be traced back to its contempt for this document. As Americans look forward to 2009, hopes of a collective sigh of relief are everywhere. The Democratic Party and Progressive Politics are swooning Independent and Republican voters with a sweet songs filled with change. Hopes for the restoration of Constitutional Law, elevated status in world opinion, and a time when we can enjoy freedom from corporate control are driving Americans to the polls this year. “Illinois Senator Barack Obama has finally signed the American Freedom Pledge, joining his fellow Democratic presidential candidates in encouraging the restoration of basic Constitutional principles after the battering they have taken during the Bush-Cheney era. One can only wonder, how with the experience of a tramped upon constitutional document, the one Democratic presidential hopeful who will not make a commitment to its restoration is even close to taking the White house. Perhaps, after four more years of the shredding of this document Americans will finally wake up to the powers at be, and realize our country’s two party system is preparing, one more time, to sell us, the world, and our freedom to the highest bidder. If you would like to see just how sick the American elite really is – how morally depraved, how intellectually diseased, how addicted to the taste of human flesh, the scent of human blood, and the sight of human suffering – then you need go no further than the speech given by Mitt Romney to the Conservative Political Action Conference on February 7, 2008. Now you might say that Mitt Romney is old news. After all, this was the very speech where he declared he was quitting the presidential race. He’s toast, he’s over, the fork has been stuck into his well-roasted hide; who cares what he says? This is of course the witless “horse-race” view that dominates political discourse in America: who’s up, who’s down, who’s getting the column inches, who’s on TV? But in reality, the American elite – or the Establishment, or the power structure, call it what you will (as long as you don’t call it what it really is: the ruling class) – is like an iceberg: most of its vast bulk exists unseen, it plows on beneath the surface, unperturbed by the media storms that rage around the small bit of exposed material at the summit. Mitt Romney is an immensely wealthy, well-connected man, a former governor of the state of Massachusetts, born and bred in an extensive web of privilege and power. His defeat in a presidential campaign changes none of that. He will simply submerge – for a time – back into those depths where the real business of the elite is largely done. Thus his words to the conservative activists remain a highly relevant indication of the mindset that holds sway over the world’s most powerful nation. They show the barbarism, hatemongering and bloodlust that are considered perfectly acceptable in the polite company of our rulers and their sycophants. 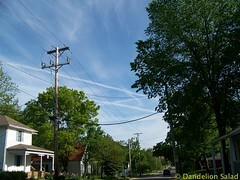 Aerosol Crimes 1st Edition + Chemtrails: What Are Those Mystery Lines In The Sky? This documentary produced by chemtrail researcher Clifford Carnicom is a must see and an excellent research tool. Five plus years into the operations has provided ample evidence in this 90min DVD that covers many topics. Over the years aerosol/chemtrail research has provided some leads but even more questions as to who and why the spraying occurs. It is clear jets are deliberately spraying the sky’s and it will not stop until enough people are aware and willing to stand up for the operations exposure and termination.